Complete, components excellent, box has wear. 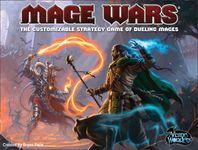 This is the English first edition, the core set now published as Mage Wars Arena. Inventoried with pieces in great condition, some shelfwear to box.